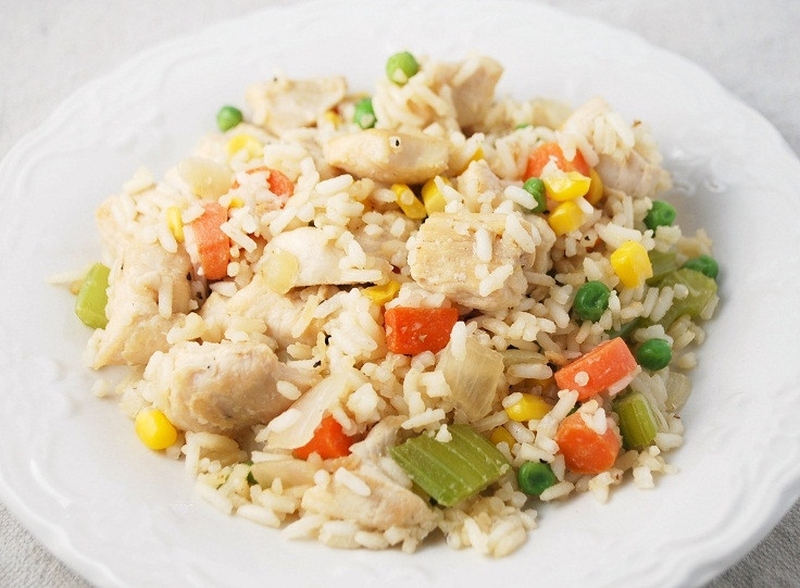 Chicken fried rice is one of the most popular dishes at Chinese restaurants all over the world. It is a great dish to make at home since you can use leftover such as eggs, cold rice, your favorite fresh or frozen vegetables and chicken pieces. Normally, fried foods contain more calories than boiled or steamed foods. For this reason, you might be curious about chicken fried rice calories. Half a cup of this dish contains 213 calories. The recommended daily intake of calories is 2000, so the food is about 11% of RDV (Recommended Daily Value). To get a clear picture of how much this is, you have to lift weights for about 58 minutes or jump rope for about 18 minutes to cut the calories in ½ cup of chicken fried rice. To keep chicken fried rice calories low, you have to prepare the dish just right. Below is a recipe you can use. Use a whisk to beat the eggs in a bowl and add pepper and salt for seasoning. Heat some oil in a frying pan over medium heat and make an omelette using half of the eggs. When the omelette is ready, turn it out onto a plate to cool. Make sure not to fold it. Repeat the procedure for the remaining beaten eggs. Place it on top of the first egg, then fold and coarsely chop. Toss the chicken strips in a medium bowl and add sesame oil, pepper and salt. Put some vegetable oil in a frying pan over high heat. Stir fry the prepared chicken strips in the frying pan for about 3 minutes. It should turn golden brown. Add garlic and onion, and then stir fry for about 2 minutes. Make sure the onion has softened. Add 2 more tablespoons of vegetable oil and let it heat up. Stir in the green onions and cooked rice. Mix thoroughly until it’s very hot. Sprinkle some soy sauce and mix well. Remove from the heat and stir in the egg you had chopped. You can garnish with sliced green onions if you wish.